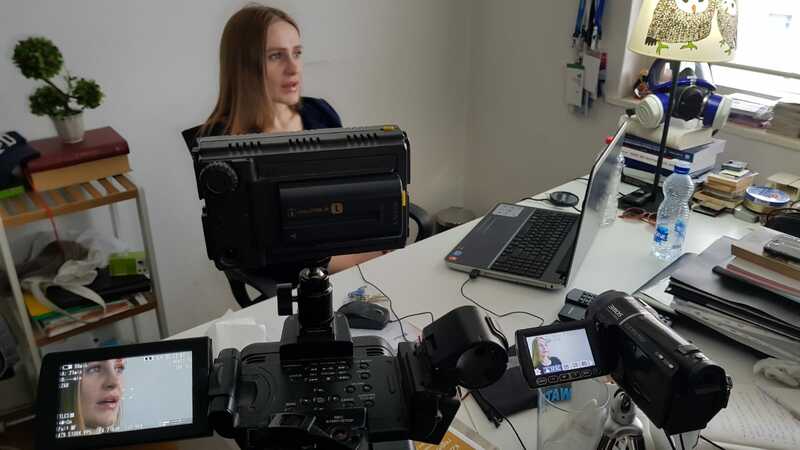 From Pristina, Una Hajdari is a Balkan based reporter able to talk both officials languages of Kosovo, Albanian and Serbian, leading her to become a well-known journalist, respected by both sides. In her work, she has focused is on nationalism, inter-ethnic tensions and economic policy in the Post-Yugoslav area. She is also one of the monitors for Reporters without Borders in the region. Question: Why has integration of the Serbian community in Kosovo not happened? Answer: One of the reasons is because Serbian minority insists on not recognizing Kosovo. The Albanian community finds this to be a resurgence of what was present in the former Yugoslavia when their rights were not recognized. The excuse of most people would be, “if you do not recognize my country, why am I responsible for you?” However, It is your [the Albanians] responsibility as the majority community to deal with the minority community just like it was the responsibility of Serbia, Yugoslavia to deal with you when you were their minority community. My perception of it is -especially when I talk with people that have these opinions- the best way for you to prove to the world that you have your own state now [Kosovo], is to accept them [Serbians] as your minority. You were once the minority in your country and you asked for your rights in that country as a minority. And now you have your own state and you have to grant those rights to your minority. Being responsible towards your minorities is something that other countries face, especially in the region but even wider, in different shapes and forms. But the best way you can be responsible for the majority community is the deal with the minorities better. Q: Has different language between Serbs, who speaks Serbian, and Albanians – who speaks Albanian – have any effect? A: The language is probably one of the main problems. When you cannot understand what someone is saying to you, you can always think that it´s a threat and it is also something negative. And none of the young Albanian population speaks Serbian and vice versa. Then, they see each other from the other side, people with whom they cannot communicate with. When they meet, they have to speak English. They have to use a third language to communicate, but that also influences the perception of something foreign. They use English in Germany, France and they use it in their own country. So, of course, they see the person as ´the other´ when they don´t speak the same language. This feeling of ‘the other side’, something that it is unknown and because you do not know the other side it causes fear. Usually, the older generations of Albanians who were educated in Yugoslavia, who speak Serbian, experience the least amount of prejudices. Even though the memories of the 90’s are fresh, they have still lived in these communities and on an interpersonal level, there are fewer prejudices. Q: Some Albanians have told me that the Serbian government uses the media to manipulate the mind of the Serbian minority in order to avoid a possible recognition of an independent Kosovo. Do you agree with this opinion? A: Manipulate their minds, it´s a relative thing because people should be able to differentiate propaganda from the news, especially when it´s your community. But there are various factors which influence the situation of fear in Kosovo among the Serbian community. It is the Serbian media and the local political representatives who again, benefit from the situation of the crisis. The situation is sad because both of those things negatively affect the Serbian community. The fact that they have to live in a situation of fear and the fact that they have to live in a situation where they don´t know what their future is in this country or in any country. The Brussels dialogue right now is almost exclusively dependent on integrating the Serbian community because Kosovo has no territorial or population interests in Serbian. The only interest that Serbia has in Kosovo is the Serbian community and the Serbian community is also the responsibility of Pristina politicians. Now you have basically a dialogue which is developing between two powers that they are fighting for more influence and of course it benefits the both of them to have a crisis in their countries. Because they stay in power and they keep in dialogue, they keep international organizations involved and when you manipulate a minority, that’s the way you can get points. So in the end, the media is an excuse, it is true, but it is also an excuse. If you do not achieve the successful integration of a minority group, they´re always going to go to a media outlet that says what they want to hear. People want confirmation bias. Every single ethnic group in the Western Balkans has confirmation bias; they will read outlets that say the things that they want to hear, they will read outlets which say the best things about their own ethnic group, and they will read outlets that confirm their idea about what they feel the society should be like. And again, because of the language barrier, if the only outlet that you can read is the one that is selling a very specific story of what you want to read it, then that effects integration. That doesn´t mean that all the media outlets are like that. There are outlets Mitrovica that they are more critical, but they have much a much smaller audience and much less confirmation bias because when you confront people with a difficult situation by being critical, using honest non-biased journalism, then they feel more scared. It’s good to live in your own bubble where you think that the world is the way you see it. This affects both the Albanian and Serbian community. Q: And the Serbian government, does it really care about the Serbian minority in Kosovo? A: In the end, the most difficult situation is for the Serbian community. They have second-class citizenship in Serbia. Because they are not granted the same services that the Serbs in Serbia are: the health care is limited to health centres in Kosovo which do not offer all the services that are necessary. Education is very limited to the University of Mitrovica, whose diplomas are not recognized in Kosovo because it is managed by Belgrade. So, there are different facets of their lives they’re not able to work through because they´re permanently in crisis. If you talk with the Serbian communities, what happened with the breakup of Yugoslavia is that everyone ended up in their own “nation” countries which were formed by a majority ethnic group. Croats in Croatia, Bosniacs ended up in the Republic of Bosnia… so, for the Serbian community, the fact is that they have to accept that they have to live in a nation-state that is not their own because the majority is primarily of a different language and also of a different religion and that’s something that a lot of them do not want to accept. Because in their perception is -and this is the perception of all ethnic groups in the region- “if I have one life to live I would rather it be in my ethnic nation-state.” For Serbians, it´s very hard to accept the Kosovo reality because it means that they would be in a nation-state that isn´t their own.